It's commonly held that the Spartans were at one time the world's greatest warriors, the clearest indicators of their fearsomeness being that they fought mostly naked, and had Scottish accents. Bringing that ancient badassness to an assault course, Spartan Race. Involving 5k of inventively merciless challenges, Spartan was originally hatched by a New Yorker in an effort to create a "more achievable version" of his wildly successful 24-hour "Death Race"; the English installment will be held in Cambridge under the auspices of a city native (and former Marine) who once challenged the founder to his own Death Race and won -- though like Nadal and last year's Wimbledon, Jason Statham was denied victory only by his absence. 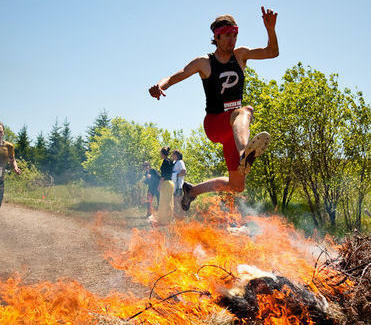 The dozen plus events kick off with a ferociously screaming downhill "War Charge", and will then see you battling your way past a pugil-wielding gladiator, fallen trees, knee-high, will-to-live-sapping mud, scramble nets, the "Mt. Impossible" greased-up wall climb, into the "Hero Spear Throw", when you'll presumably seek out the person who suggested you sign up. The rich tapestry of pain continues as participants wade though neck-high, ice-cold water, leap over burning hay bales, and crawl under barbed wire, as well as face three "mystery" challenges -- tough, as you won't be able to practice for them. As opposed to the burning hay bale, and the gladiator. Besides "still being alive", post-race entitlements involve an after-party with comp beer, bbq, and live entertainment, plus a medal/t-shirt for all those who actually finish. The overall winner also bags replica Spartan headgear, which will only look authentic if you're barely covering your other helmet.